Roller Network maintains continuous live streaming audio feeds for NOAA Weather Radio stations WXK58 and WWG20 from our colocation datacenter. Please direct questions, feedback, or trouble reports to support@rollernet.us regarding these streams. For WXK58: Nevada: Carson, Douglas, Lyon, Storey, and Washoe. California: Alpine, El Dorado, Nevada, and Placer. For WWG20: Nevada: Churchill, Lyon, Pershing, and Washoe. California: Lassen, Plumas, Sierra. 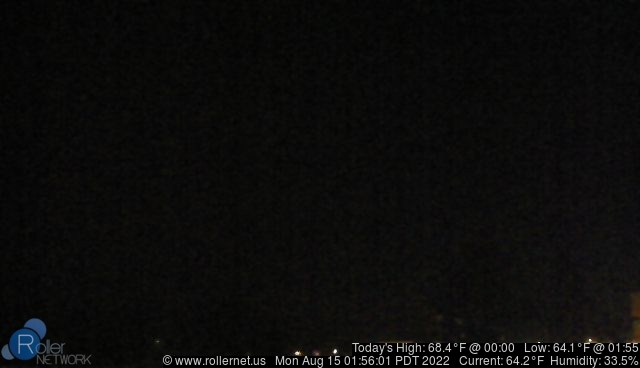 Weather camera image refreshes every minute. Click for large version. Contact us for reuse permission. Let us know if you're using our weather radio streams. Please link back to www.rollernet.us or otherwise credit us as the stream source. Weather radio streams are provided independently by Roller Network and is not endorsed by the NOAA or the NWS. Weather radio streams are provided as is at your own risk.